The new SX is certain to have slightly less punch than its predecessor the Ninja H2. But, though its power delivery has been smoothed, shifted, and made more sane for street use, there’s still 207 bhp on tap at top speed with ram air advantage (per Kawasaki). 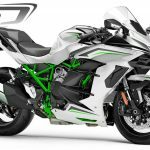 The SX’s comparative acceleration may be slightly less, and it’s top speed may be different due to gearing, it also has the advantage of aerodynamics over the half-faired H2. 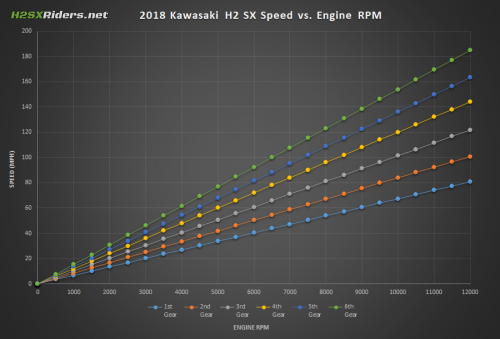 So, through the simple magic of gear ratios and Excel, I’ve run the numbers and determined that the theoretical top speed of the new Ninja H2 SX is 185 mph (297 kph) . . . well, 184.7 mph to be precise. 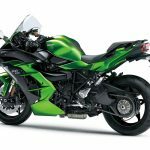 Max power is made at 11,000 rpm, per Kawasaki. Redline is assumed to be 12,000 rpm, based on pictures of the tach. It’s assumed there’s adequate power @ redline to reach max speed based on gearing. It’s assumed there’s adequate power @ redline to overcome aerodynamic effects. Rolling rear wheel circumference is calculated from OEM tire size (instead of measured circumference. As tires wear, their circumference changes, thus the bike’s indicated speed with change slightly over time). Most owners will probably not be too concerned about this stat, but there will be a subset out there who do. 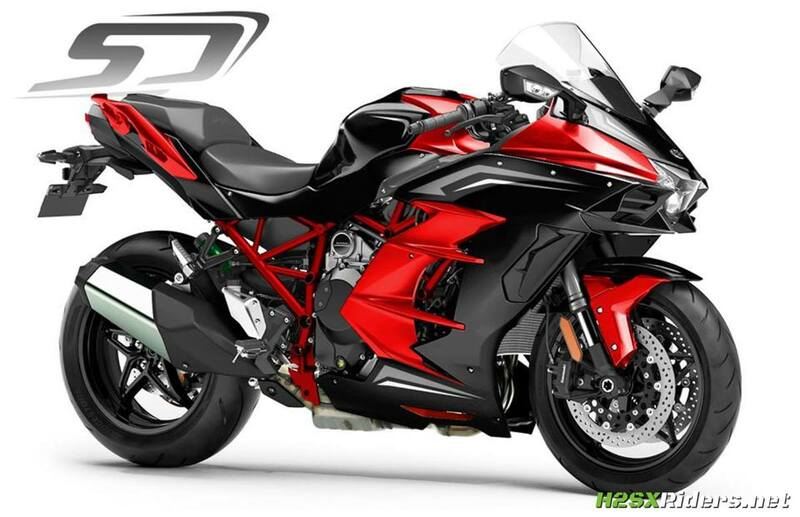 They will modify the SX just as owners modify the H2 and H2R, but maybe not to the same extent. 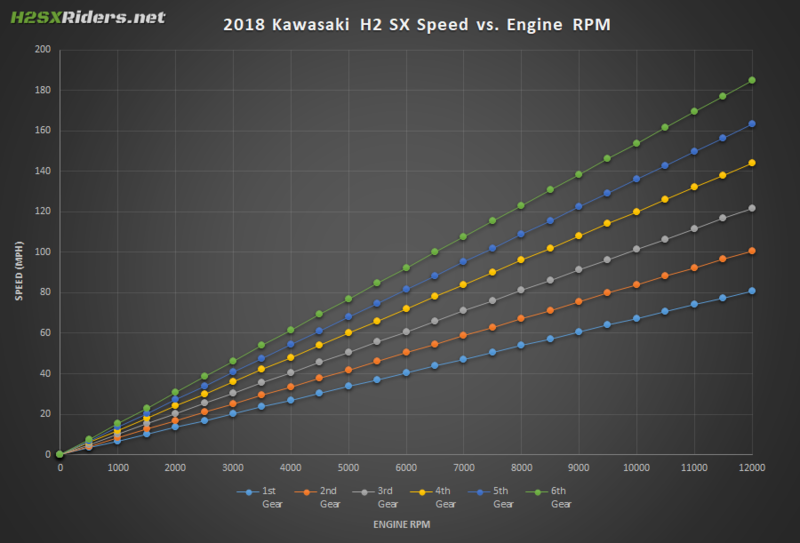 Assuming the SX has enough horsepower to overcome aerodynamic drag, a simple front/rear sprocket change that yields a secondary reduction ratio of less than 2.26 should get you over that 200 mph threshold. 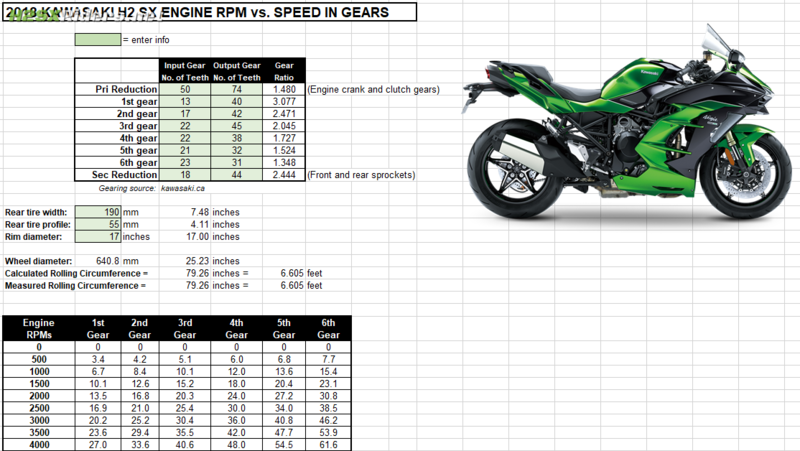 If you want to play with the numbers yourself, just hit the “H2SX SPECS” menu above to access the Gearing Spreadsheet. 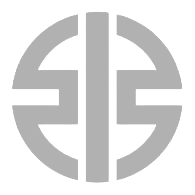 Additionally, I’ve sent relevant gearing info to gearingcommander.com and the H2 SX is now in their web based calculator.